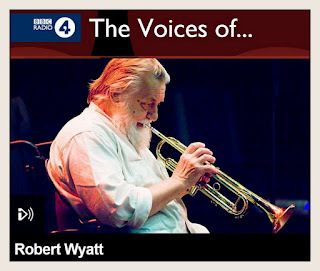 Radio 4 della BBC ripesca la puntata con Robert Wyatt della serie The Voices of... per la gioia (anche) di quanti non la poterono seguire la prima volta, circa cinque anni fa. E' stata prodotta da Alan Hall per A Falling Tree. La consiglia caldamente Piers Plowright: "Radio at its most intimate – as if we are taking tea (which at one point we are) with the storyteller – Wyatt himself. The story flows through his life and work, taking in artistic and musical influences, all told in a deceptively casual way, making light of the triumphs and disasters. In the background we sense the presence of Wyatt’s artist wife, Alfie, and her importance to him, though she never says a word. "Life," says Wyatt near the end of the programme, "is like climbing a mountain and looking down; as we climb, the village from which we started gets smaller as the landscape gets bigger."